Photo courtesy of David Bellamy and Howard Bellamy. 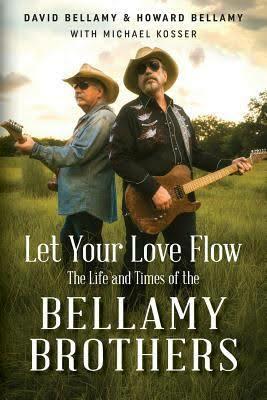 LET YOUR LOVE FLOW: THE LIFE AND TIMES OF THE BELLAMY BROTHERS by David Bellamy and Howard Bellamy, with Michael Kosser. DarBella Publishing, April 2018. Cover photo courtesy of David Bellamy and Howard Bellamy. Rough times. Great times. Fun times. LET YOUR LOVE FLOW takes you on the wild ride of the career of the Bellamy Brothers in a fun, easy read. David and Howard Bellamy were born into a farming family in rural Florida. Growing up, they worked on the farm, played and sang in church, and began forming a musical style that would become their own, distinctive sound. Beginning in 1976, when the song LET YOUR LOVE FLOW became a monster worldwide hit for David and Howard Bellamy, until today, the brothers have toured the world, gaining millions of fans. The boys have also had a lot of fun along the way, fun that is recalled, in a sometimes uproarious manner, in their new autobiography. Whether it’s accidentally burning down a barn, to chasing cattle, to having their mom and dad see them play in local strip joints, the Bellamys take you on the wild ride that has been their experience in life. LET YOUR LOVE FLOW is also another in a long line of books that details the seedy underbelly of the recording industry in America. It doesn’t matter if it’s New York City, Los Angeles or Nashville, recording industry executives seem to thrive on cheating musicians and songwriters, and it’s been no different with the Bellamy Brothers. David and Howard go into detail about how long they were in the business before they actually started making money. They were preyed upon by a variety of managers, producers and other executives. The biggest money maker in the industry is publishing rights for songs, and it’s common for fledgling musicians and songwriters to sign away these rights early in their careers. With the success of one song in 1976, the Bellamys quickly built a reputation of being a hardworking, difficult to categorize duo. Pop or country? They left that decision up to their fans, and those fans have never deserted them. London, Berlin or a string of islands in the Pacific Ocean, the Bellamys have built a loyal, thriving fan base. The story they tell is of a base that’s never deserted them, even in these days when radio is monopolized by “new country” which, to this reviewer, sounds so much like a cross between K-Pop and 1980s boy bands. David and Howard continue to reach their fans, and make new fans, thanks to their YouTube channel. They created their own record label to control their music. They’ve embraced technology to get their music out, and things are going great for them, even without the benefit of radio play. Country radio, to its detriment, has abandoned established acts, and it’s country radio’s loss. So, take this fun ride with the Bellamy Brothers. You’ll laugh, you’ll cry, you’ll be in on all the jokes, and you’ll feel like seeing the world, from the stage, with them. You won’t feel like you’re just along for the ride.